He will make you ~swoon~. Thanks to his recent projects, we’ve seen Tony’s acting chops, but did you know that this 22-year-old hottie is also a singer? He’s even auditioned for one of the country’s most popular singing competitions. 2. He has some swoon worthy moves. Tony is very athletic. He’s a trained gymnast and has spent years mastering the sport, so you know he’s all about discipline. Plus, his abs don’t lie. 3. He knows good food. Guy knows what good food is. Just look at him staring at the new McDonald's McSpicy. Don't you wish you could be that burger? Affectionately called “Sharky,” Tony is known for his deep love for the water. Whenever he has time off, he heads for the nearest beach to go snorkeling or diving—so you know he’s always up for an adventure. Whether it’s jeans and a plain white tee or a classic suit, there isn’t anything this guy can’t pull off. Tony matches every outfit with confidence. 6. He has a soft spot for his family. All you have to do is take a peek at this big ol’ softy’s Instagram account to know how much he loves his family. Tony takes being a son and a kuya seriously. 7. He loves his fans. What’s sweeter than a down-to-earth guy who appreciates the people who support him and isn’t afraid to show it? Nothing. 8. He’s not afraid to try again. 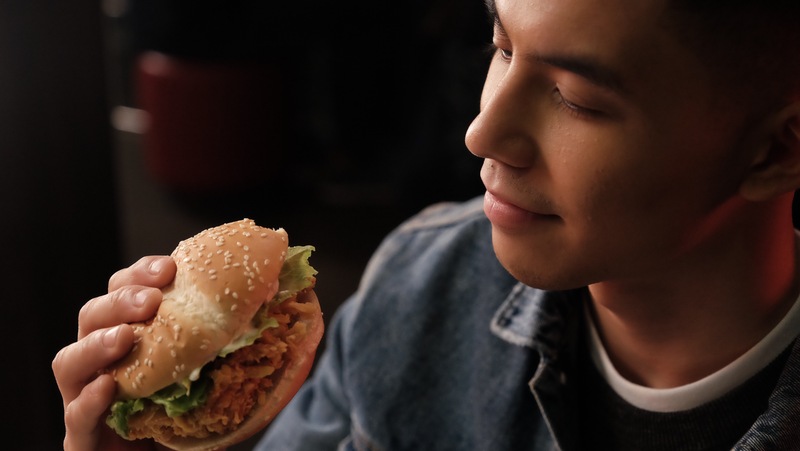 We may have had to shed a few tears when he starred in his first McDo commercial, but Tony is set on winning our hearts in his new commercial for McSpicy.